Broadly speaking, our laboratory studies the biology of critical illness and host determinants of lung injury. Our research focuses upon the innate arm of immunity, specifically examining effector function of myeloid cells such as macrophages and neutrophils and how they recognize and respond to exogenous pathogen associated molecular patterns (PAMPs) or endogenous alarmins. We are interested in probing host-pathogen interactions to examine mechanisms of host protection following pathogen-triggered injury from products of extracellular gram negative pathogens such as Pseudomonas aeruginosa and Klebsiella pneumoniae. We are also interested in the factors that shape repair and resolution following injury, specifically factors derived from hematopoietic cells such as platelets and red blood cells that can influence the course of inflammation. We utilize a repertoire of relevant murine models of injury, molecular genetic approaches, in vitro biochemical assays, and human bio-samples to examine innate host defenses of the lung. Dr. Lee’s clinical interest and focus is acute lung injury, acute and chronic respiratory failure, transfusion consequences in the critically ill, sepsis-related immunosuppression, and other critical illness syndromes. Her clinical service is focused in the Medical Intensive Care Unit and the Advanced Lung Disease Service of the University Hospital. 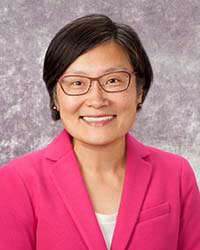 Dr. Lee is actively involved in research training and teaching of medical students, graduate students, residents and fellows in Pulmonary and Critical Care Medicine. Her educational interest primarily focuses on training the next generation of physician-scientists and scientists interested in innate immunity, inflammation, cellular and molecular pathology of the lung. McComb JG, Ranganathan M, Pilewski JM, Ray P, Watkins SC, Choi AM, Lee JS. CX3CL1 Upregulation is Associated with Recruitment of CX3CR1+ Mononuclear Phagocytes and T Lymphocytes in the Lungs during Cigarette Smoke Induced Emphysema. The American Journal of Pathology. 2008; October 173(4): 949-61. Mangalmurti NS, Xiong Z, Hulver M, Ranganathan M, Liu XH, Oriss T, Rubin M, Triulzi D, Choi A, Lee JS. Loss of Red cell Chemokine Scavenging Promotes Transfusion Related Lung Inflammation. Blood. 2009; January 29; 113(5): 1158-66. Mangalmurti NS, Chatterjee S, Chen GJ, Mohammed A, Anderson E, Siegel DL, Schmidt AM, Albelda SM, Lee JS. Advanced glycation endproducts on stored erythrocytes increase endothelial reactive oxygen species generation through interaction with RAGE. Transfusion. 2010; November; 50(11):. Mei J, Liu Y, Dai N, Favara M, Greene T, Jeyaseelan S, Poncz M, Lee JS, Worthen GS. CXCL5 regulates chemokine scavenging and pulmonary host defense to bacterial infection. Immunity. 2010; July 23;33(1): 106-17. Lee JS, Gladwin MT. Bad Blood: The Risks of Red Cell Storage. Bedside to Bench Invited Commentary. Nature Medicine. 2010; 16: 381–382. Xiong Z, Cavaretta J, Qu L, Stolz DB, Triulzi D, Lee JS. Red cell microparticles show altered inflammatory chemokine binding and release ligand upon interaction with platelets. Transfusion. 2010; 51(3): 610-621. Xiong Z, Leme AS, Ray P, Shapiro SD, Lee JS. CX3CR1+ Lung Mononuclear Phagocytes Spatially Confined to the Interstitium Produce TNF-Alpha and IL-6 and Promote Cigarette Smoke Induced-Emphysema. The Journal of Immunology. 2011; March 1;186(5): 3206-14. Zhao Y, Xiong Z, Lechner EJ, Chan Y, Zhang Y, Ross MA, Stolz DB, Rosengart MR, Pilewski J, Ray P, Ray A, Silverstein RL, Lee JS. Thrombospondin-1 triggers macrophage IL-10 production and promotes resolution of experimental lung injury. Mucosal Immunol. 2014; March;7(2): 440-8. Zhao Y, Olonisakin TF, Xiong Z, Hulver M, Sayeed S, Yu MT, Gregory AD, Kochman EJ, Chen BB, Mallampalli RK, Sun M, Silverstein RL, Stolz DB, Shapiro SD, Ray A, Ray P, Lee JS. Thrombospondin-1 regulates neutrophil microbial killing by restraining granule serine proteases during K. pneumoniae infection. Mucosal Immunol. 2014; December 10; 8(4): 896-905. Balasubramanian KK, Maeda A, Lee JS, Mohammadyani D, Tyurin VA, Tyurina YY, Ray P, Klein-Seetharaman J, Mallampalli RK, Bayir H, Fadeel B, Kagan VE. Extracellular Cardiolipins Are Phagocytized by Macrophages and Silence LPS Signaling by Mimicking Immature Lipid A. Science Signal. 2015; September 22;8(395):.